Preface. List of contributors. 1. 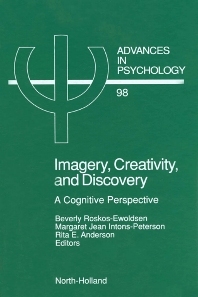 Imagery's role in creativity and discovery (M.J. Intons-Peterson). 2. The ins and outs of working memory: Overcoming the limits on learning from imagery (D. Reisberg, R. Logie). 3. Images are both depictive and descriptive (D. Chambers). 4. Imagery, reconstructive memory, and discovery (I.E. Hyman, Jr.). 5. Mental imagery: Fixed or multiple meanings: nature and function of imagery in creative thinking (G. Kaufmann, T. Helstrup). 6. The ambiguity of mental images: Insights regarding the structure of shape memory and its function in creativity (M.A. Peterson). 7. Discovering emergent properties of images (B. Roskos-Ewoldsen). 8. Multiple perspectives on discovery and creativity in mind and on paper (R.E. Anderson, T. Helstrup). 9. Mental imagery and creative discovery (R.A. Finke). 10. Imagery and discovery (S.K. Reed). 11. Imagery, creativity, and discovery: Conclusions and implications (B. Roskos-Ewoldsen, M.J. Intons-Peterson, R.E. Anderson). 12. Author index. 13. Subject index. What factors affect creativity and the generation of creative images? What factors affect the ability to reinterpret those images? Research described in this book indicates that expectations constrain both of these attributes of creativity. Characteristics of the imagined pattern, such as cohesiveness or its psychological goodness, also affect image generation and reinterpretation. Other evidence indicates that images can be combined mentally to yield new, manipulable composites. Cognitive models encompass the research and extend it to fields as diverse as architecture, music, and problem solving.